Shabbychick Junk. : I'm behind on my sample cards! I'm behind on my sample cards! This weekend I finally got a chance to sit down and stamp a card! It feels like ages since I've stamped, even though it's been only about a week or so! I'm still trying to motor through all of the Crafty Secrets stamp sets, making 25 samples of each for Crafty to send out to stores that carry their product. 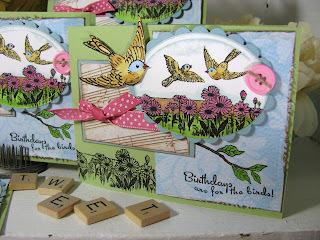 This little scene was done with Crafty's Bird Lovers stamp set, and nestabilities oval die cuts. The Crafty Secrets website just got a cool new facelift! 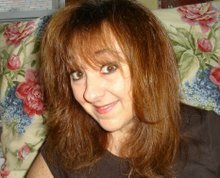 Stop by and check it out when you have a chance! It looks FABULOUS! 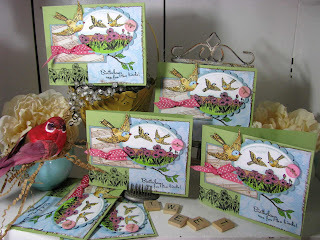 I wanted to do these bird cards in springy colors, so I opted for light blues, celery greens, light yellow and pink. I met a bunch of fun girlies Friday night at Archivers, so I worked on 25 of these cards and finally finished them yesterday. When I got to Archivers, there were beautiful surprises waiting for me from friends Chris Fuhs and Kristina Lewis....Chris gifted me with these bright, fun BINGO cards to feed my addiction, and Kristina found this gorgeous teacup for me! THANK you, girls, you made my night! Very pretty cards! I love the colors and the cloud designer paper. 25 cards??!!!! Wow, that is amazing! (It took me all last week to just make 1) I love the layout and colors you used; probably one of my favorite sets, and the sentiment is the best! Love, love, love, these cards! Congrats on your special gifts, your friends know you well! This card is STUNNING! I love your color choices in this one. On another note, I just purchased some magazines yesterday and saw some of your beautiful work! I believe the magazine was Create and Decorate. WOW!!! Your cards are amazing. The cards are gorge, girl! You have SUCH a way with all things vintage! I *heart* you! And I miss you too. Wow, your bingo cards are neat! Love the cards!!! Love your sample cards. 25 samples is quite a task! 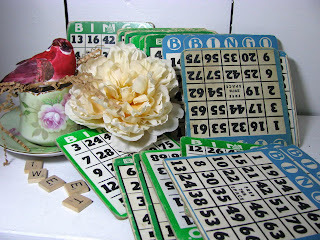 What blessings with your bingo cards. Things that make you go OOOOOH! It's a whopper of an Easter!